Add a sturdy, classic, and familiar martin home to your area with this Lonestar Alamo Martin House with Round Entrances. 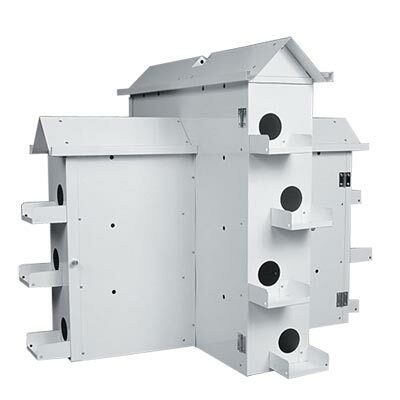 This robust, white aluminum shelter provides roosting spots for up to 14 bird families, and its fantastic features make it one of the best homes available. The 0.04 gauge, all aluminum body creates a lightweight yet hardy abode, and its open center perfectly accommodates the Lonestar Pole System with Winch (not included) for raising and lowering the piece. Its white color also helps dissipate heat, keeping the interior ventilated, and the 2.125" diameter, round openings allow martins to access the shelter. Each of the fourteen compartments measures 6" wide, 12" deep, and 6" tall, for birds to keep their eggs toward the back of the compartment and diminishing predation by owls and hawks. The offset entries each sport a porch and guard rails, providing plenty of perching area for birds and reducing territory disputes. Two sides of the shelter have three compartments, while the other two sides have four, offering a wealth of nesting sites for your martins. The hinged doors on the compartments make nest checks and maintenance simple. The aluminum body forms a sturdy home, and its white color remains crisp for several seasons. Help the young martins in your area find a nesting site by adding this Alamo Martin House with Round Entrances to your yard. Assembly required. Made in the USA.